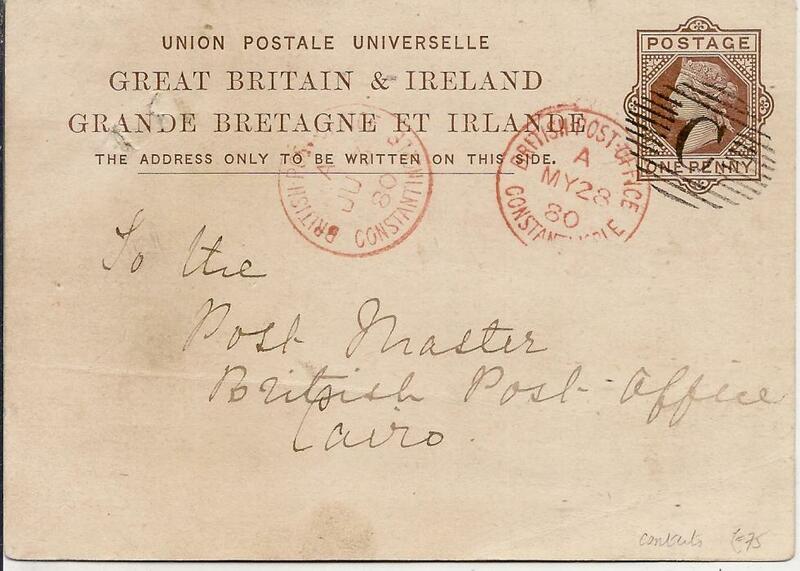 (Postal Stationery) 1880 Great Britain 1d. 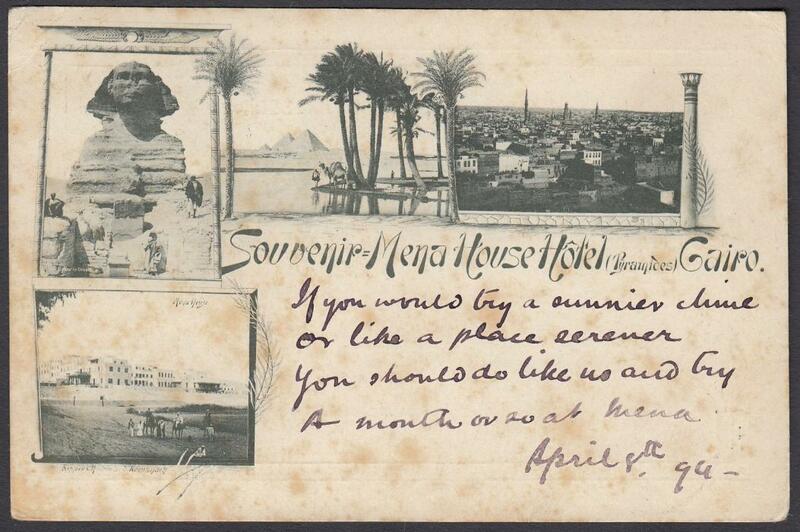 stationery card to British Post Office, Cairo cancelled by full and fine �C� obliterator, British Post Office Constantinople index A cds alongside, reverse with Alexandria and Suez cancels; some pinholes. 1841 Entire to Malta bearing red unframed ALEXANDRIA cds of the British Post Office. On arrival disinfected by slitting and struck with d.c. 'PURIFIE AU LAZARET/MALTE' cachet. Annotated to go by English steamer. 1841 entire to MALTA endorsed to travel by French ship, bearing fine ALEXANDRIA double-arc date stamp, two diagonal disinfection slits with unclear cachet on front; arrival backstamp. 1843 Entire to Confolens bearing 'ALEXANDRIE * EGYPT' date stamp of the French Post Office and red boxed 'PAQUEBOTS DE LA MEDITERRANEE'. Rated '9' decimes on arrival. Routed via Malta where disinfected and LAZARETTO cachet applied on the reverse. 1845 Entire bearing the despatch cds of the French Post Office at Alexandria and addressed to Livorno, Italy. Routed via Malta where disinfected by slitting and where the cachet 'PURIFIE AU LAZARET/MALTE' was applied. Obverse also bears arrival maritime handstamp 'LIVORNO * VIA DI MARE C'. Rated 21 crazie. 1858 Entire to Livorno, Italy, bearing despatch cds of the French Post Office at Alexandria. Disinfected by rastel slits on arrival and bears the boxed cachet 'UFFICIO DI SANITA/ALLE BOCHE DEL PORTO'. Rated 13 crazie. 1861 Family letter to Dijon, France. 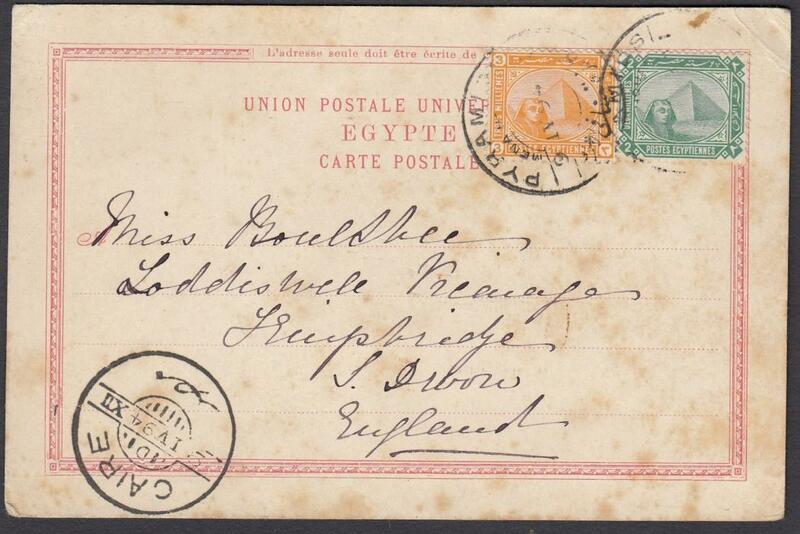 On reverse fine d.c. 'POSTA EUROPA CAIRO' date stamp. 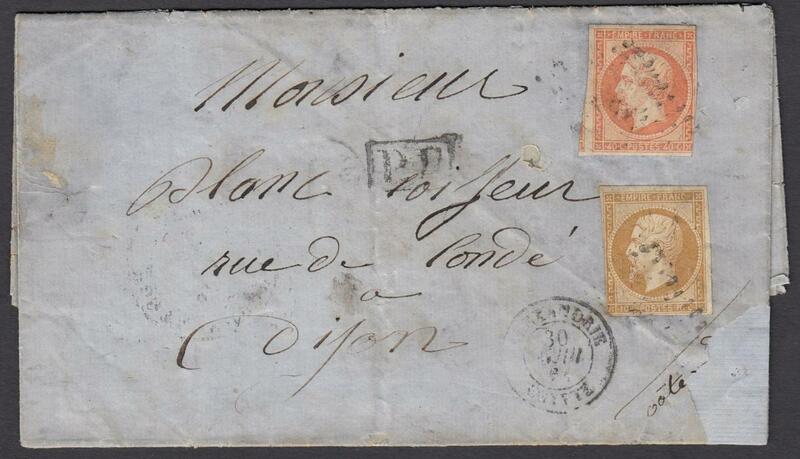 Taken to Alexandria, letter put into the French Post Office and franked 10c & 40c Imperf Napoleons. On reverse also MARSEILLE transit cds. 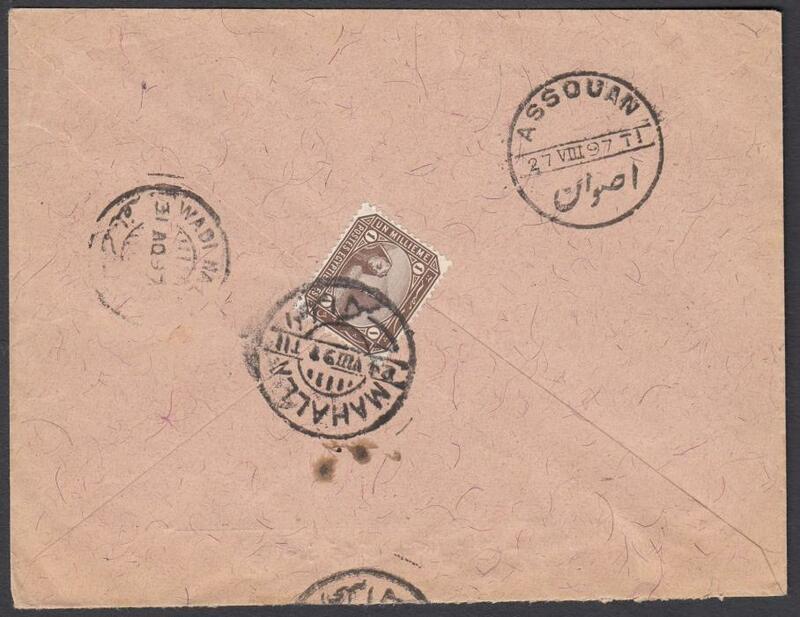 1862 stampless entire MANSURA to BOULAC with ship's endorsement at top, without postal markings; vertical filing crease. 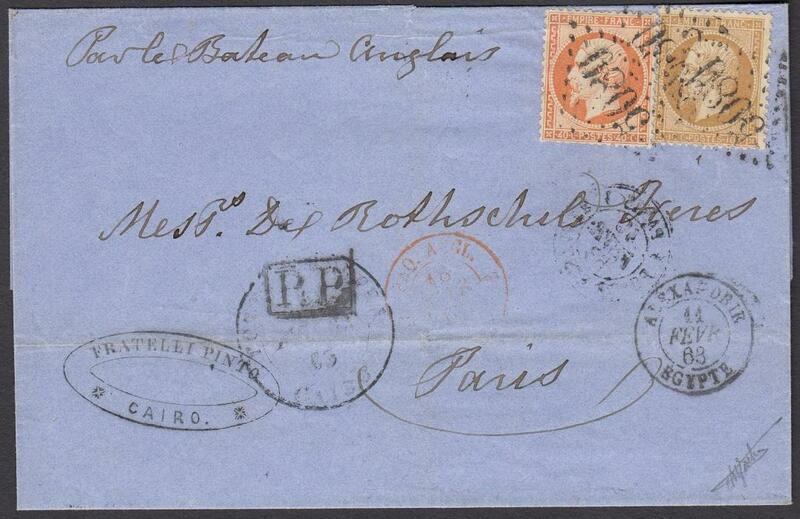 1863 wrapper to PARIS bearing 'POSTA EUROPA CAIRO' date stamp, which took the item to ALEXANDRIA as shown by French P.O. cds. 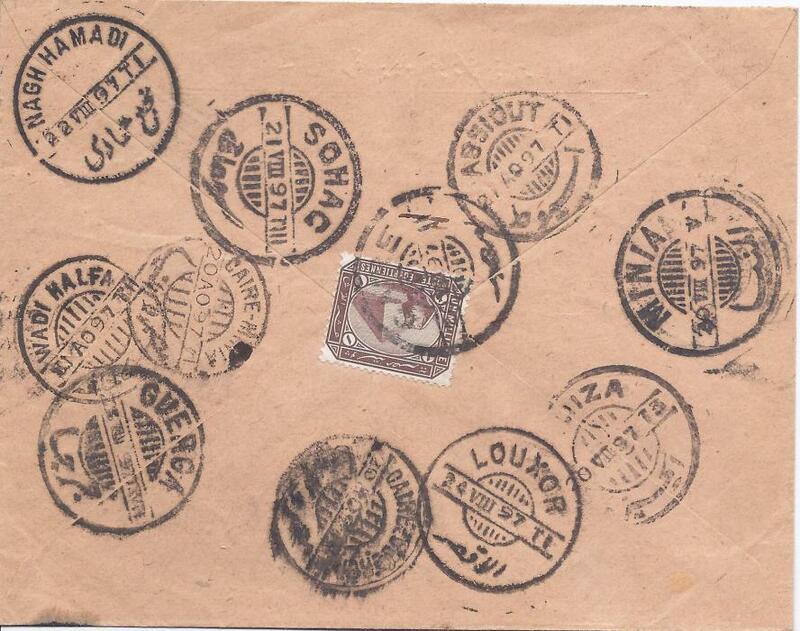 Franked 10c & 40c Napoleon tied by '5080' cancel allocated to Alexandria. Annotated to go by English ship. 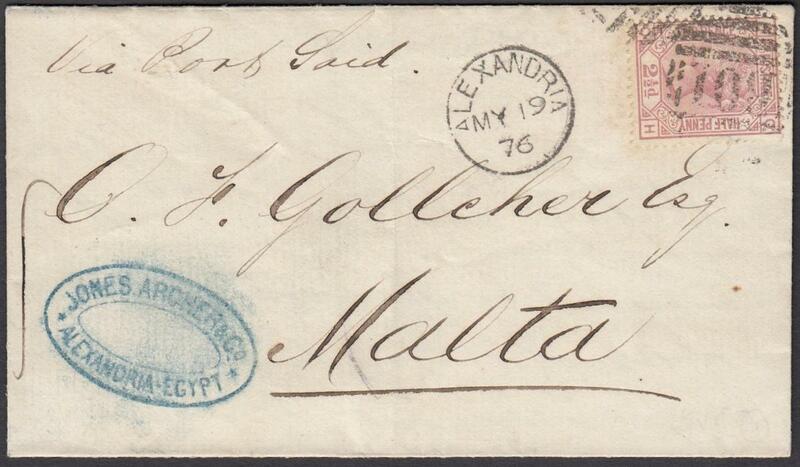 1867 (MY 19) cover to MALTA franked Great Britain 2�d., OH, plate 3, tied pair 'BO1' obliterator with ALEXANDRIA cds in association; arrival backstamp. 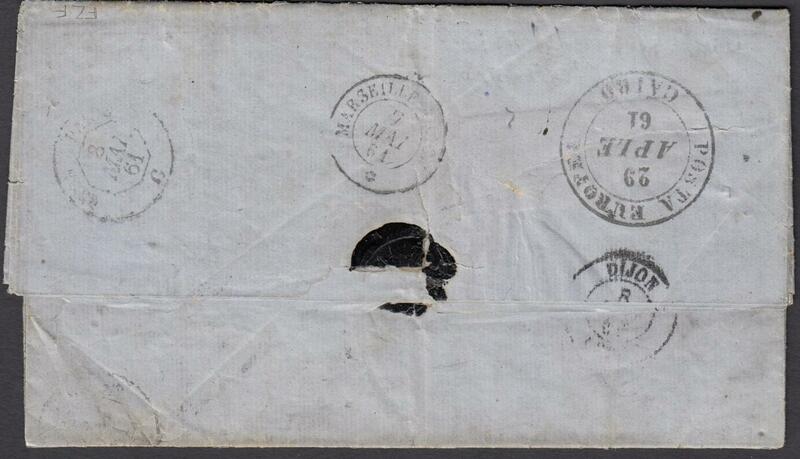 1869 outer letter sheet to London franked vertical pair GB 6d, GD-HD, plate 8, cancelled with 'B01' obliterators, ALEXANDRIA cds in association, red LONDON arrival. 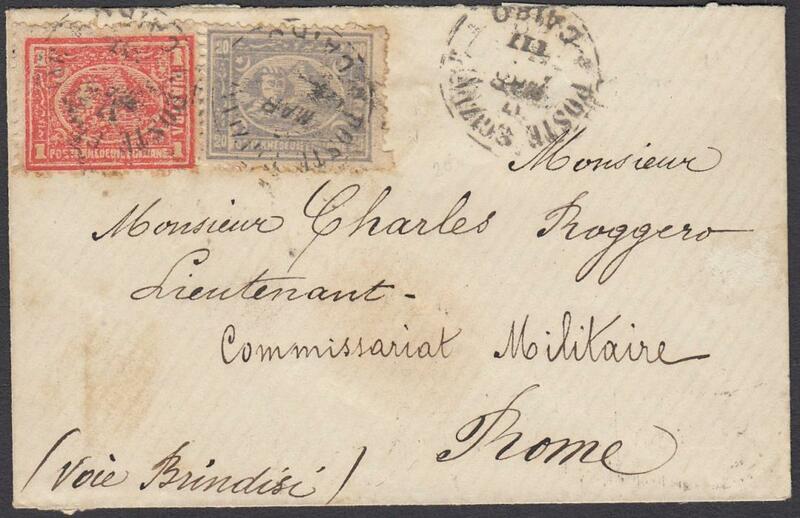 1871 entire to Germany bearing single franking 15sld tied 'ALEXANDRIEN' cds, endorsed "Via Triest! ", arrival backstamp; fine condition. 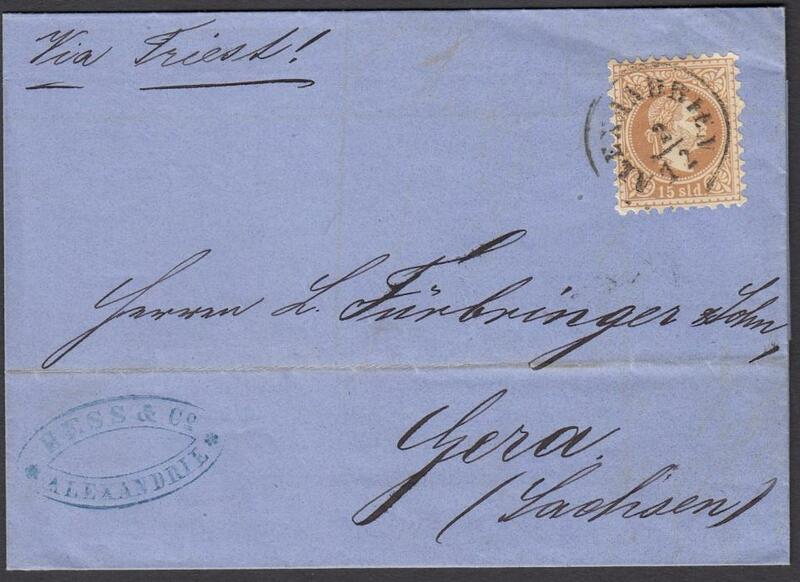 1872 entire to Germany bearing single franking 15sld tied 'ALEXANDRIEN' cds, arrival backstamp; horizontal filing crease. 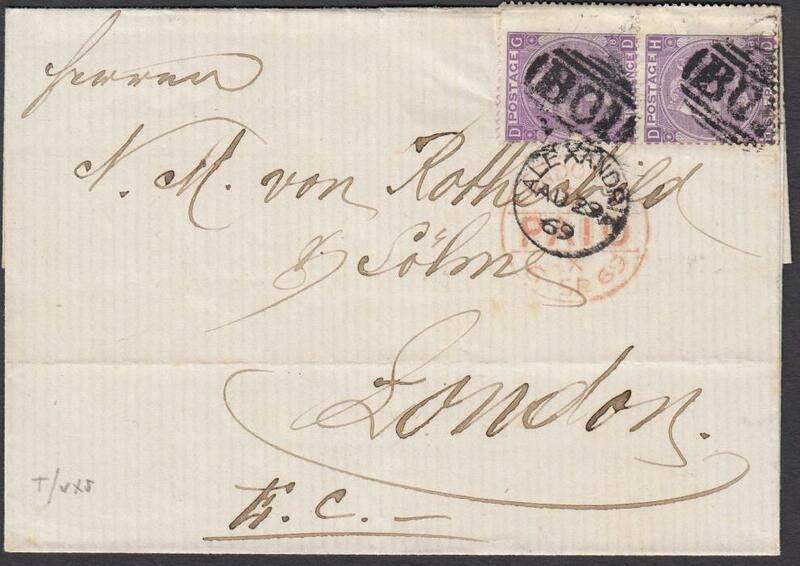 1874 (OC 2) part cover to Aden franked Great Britain 1873-80 6d grey, ED, plate 13, tied 'B02' obliterator, 'A SUEZ' cds in association at left, reverse with ADEN STEAMER POINT arrival cancel; part of reverse removed and reinforced. 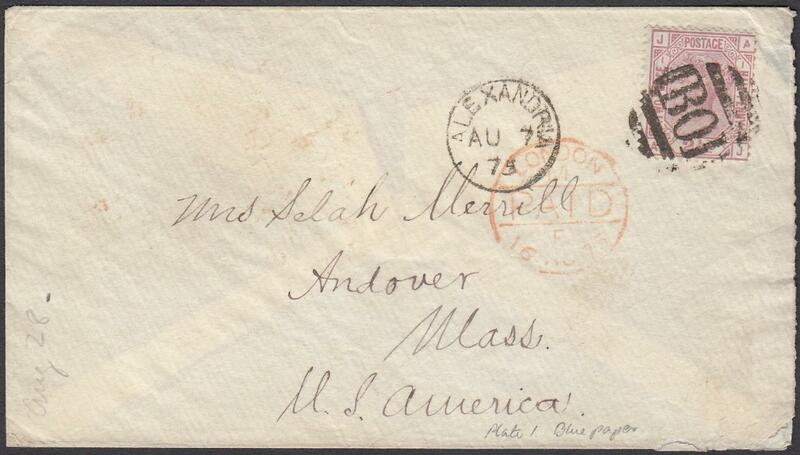 1875 (AU 7) cover to Andover, United States franked Great Britain 1873-80 blued paper 2�d, AJ, plate 1, tied 'B01' obliterator, ALEXANDRIA cds in association. LONDON transit, NEW YORK PAID ALL backstamp. 1877 cover to ROME, endorsed "Voie Brindisi" franked 'Bulaq' 20pa grey-blue and 1pi red tied 'CAIRO' cds, reverse with BRINDISI transit and ROMA arrival cds; fine and clean condition. 1894 Very early picture postcard of the 'Mena House Hotel' to Devon franked 2m & 3m tied by hotel date stamp. 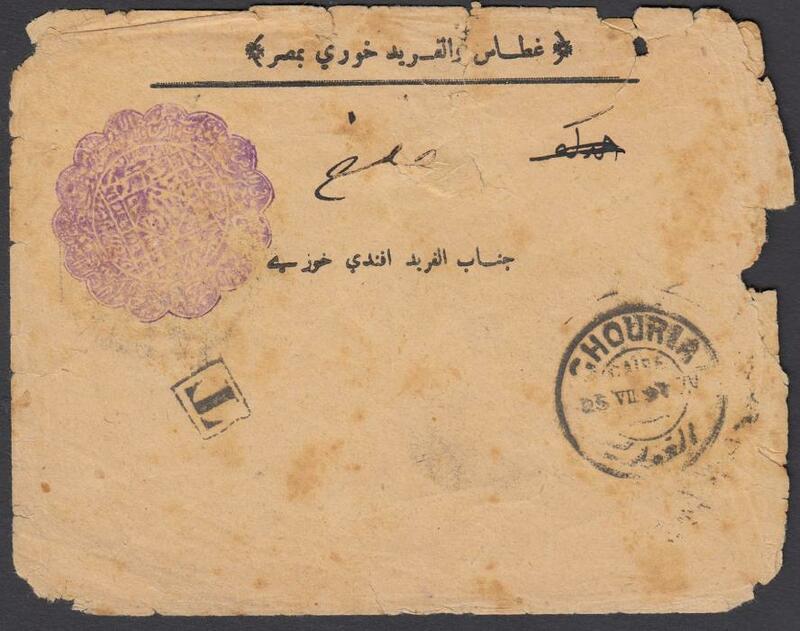 1897 Official cover from Ghourja (Cairo) to Wadi Halfa, Sudan, bearing rare official seal in violet. 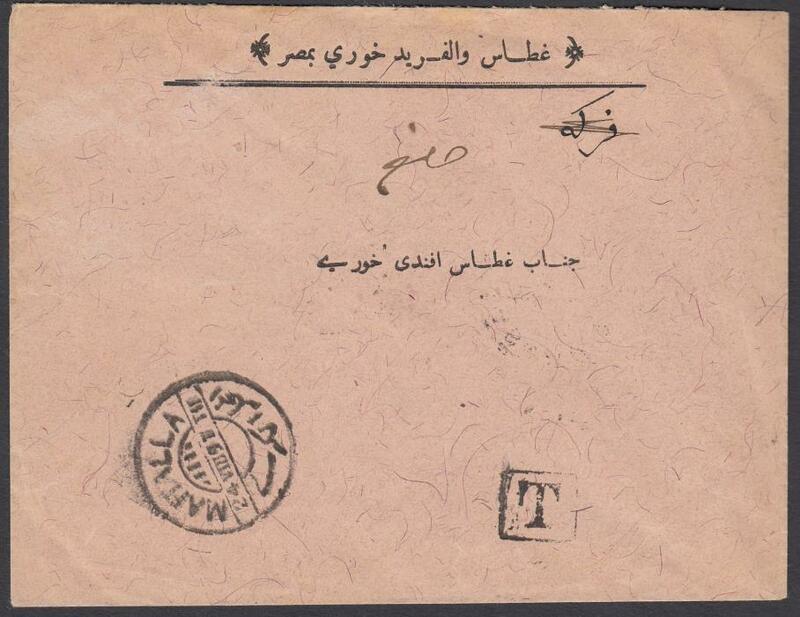 1897 undefranked cover to Sudan bearing 1m. on reverse tied Caire cds, Ouerga and Luxor cds on front together with framed 'T' handstamp. With a fine array of backstamps. 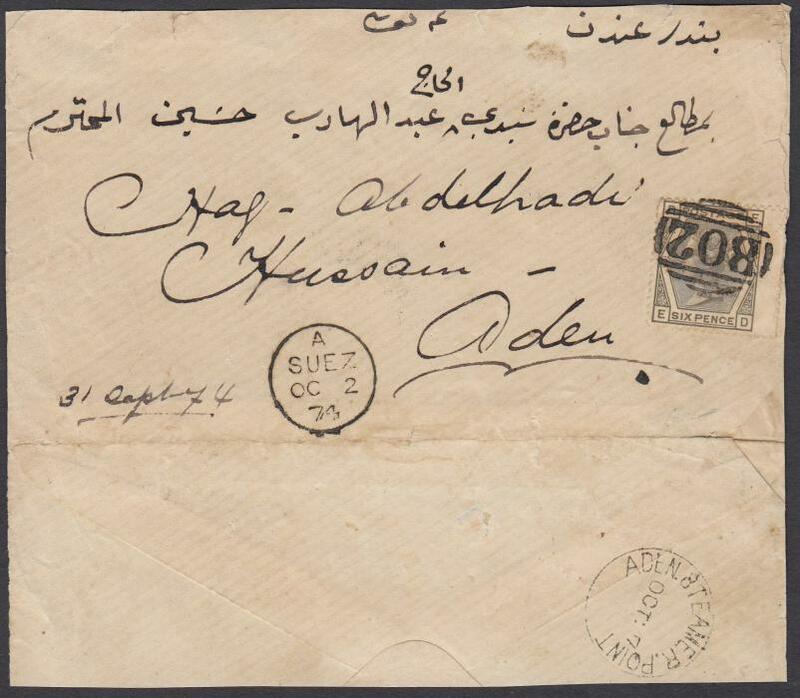 1897 under-franked cover to Sudan bearing 1m on reverse tied 'MAHALLA' cds, repeated on front together with framed 'T' handstamp. 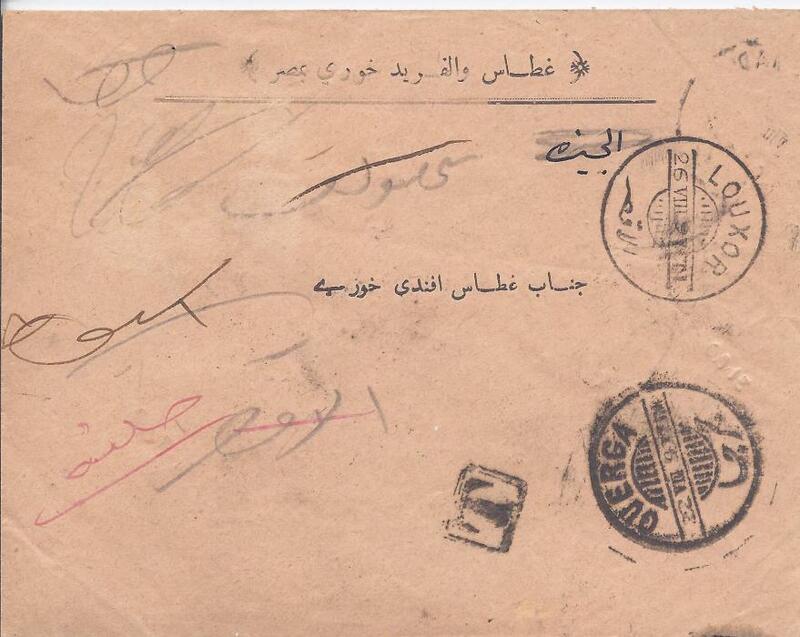 ASSOUAN and WADI HALFA backstamps.